While they might not be for everyone, there some benefits that various shoe companies are claiming. They claim that the extra cushion provides a softer ride, which you cannot disagree with. They also claim that the extra cushion lessens the impact on your joints and can reduce the amount of recovery time needed after long or higher intensity runs. Another claim is that the extra cushion provides an increase on energy return, meaning that the shoes will provide more of a spring than lesser cushioned shoes. The extra cushion in these max cushioned shoes can be a lifesaver for people coming back from injuries or just can’t handle the impact that they once could. That is not to say that you couldn’t benefit from a max cushioned shoe if you don’t fall into those two categories. Your own personal preference will play into what you like wearing. My training partner loves more cushion, while I tend to run most of my miles on less cushion. It’s just what feels best to us. 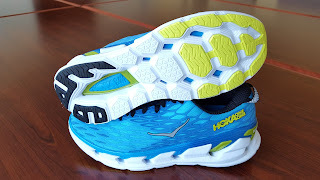 I have reviewed the Hoka One One Clifton 2 last year, which is still one of my favorite cushioned shoes (click here to view my review). The Clifton 2 provides tons of cushion without losing ground feel. The Clifton 2 won the Summer 2015 “Editor’s Choice for Best Ride” from Competitor.com. Well, The Vanquish 2 just won the Spring 2016 “Editor’s Choice” from Competitor.com. 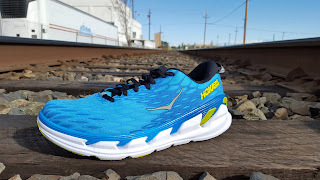 Hoka One One is on a roll. If you are looking for a really cushy shoe that doesn’t weigh a ton, you should take a look at that Vanquish 2. 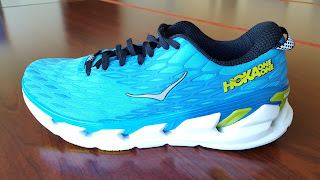 It is the most cushioned shoe that I have ever run in. The heel is 32 mm off the ground, which is about 10 mm higher than most of the shoes that I run in. It has a 5mm heel drop, which I like because a lower heel drop tends to put your body in a more natural position. The crazy thing is that with all of that cushioning, it only weighs 9.8 ounces. The Vanquish 2 is made with a dual-layered midsole that is engineered with two different EVA compounds. 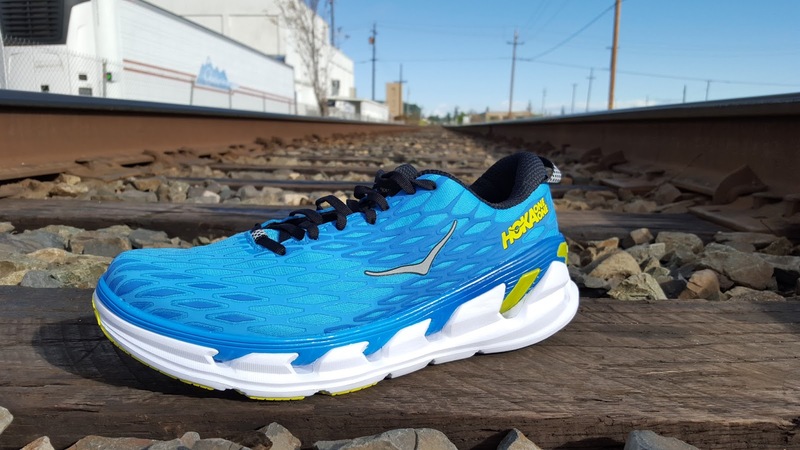 It has the oversized cushioning that you have come to expect from Hoka One One. This extra cushioning allows you to have a nice, soft landing. Even though there is a lot of cushion, you don’t feel like you are high off the ground thanks to the way Hoka designs their shoes. Check out the technology that goes into Hoka One One shoes (click here). The Vanquish 2 features a cradle design where your foot sits inside the cushioning. Your foot is surrounded by the sides and bottom of the two layer EVA foam shell. If you are looking for a shoe where you have lots of ground feel, this is not the shoe for you. The surprising thing for me though is that the shoe was still rather nimble. 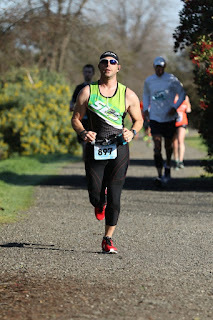 The faster you run, but more nimble it is too. I felt that the Vanquish 2 had a great deal of energy return as well, which is not something I would expect out of a max cushion shoe. For anyone looking for any negative comments, I only have two for you. The price is a little higher than the average price of running shoes at $170 for the Vanquish 2. I will say that if you are runner that is looking for cushioned shoe, the price is more than reasonable for the value you get out of this shoe. The only other negative is that the Vanquish 2 runs a little small, so buy it a ½ size larger than your normal running shoes. I normally wear a size 10 and the Vanquish 2 in a size 10 was rubbing on the outside of my big toe. I exchanged them for a size 10.5 and they fit great. Neither of these negative things should be a deal breaker though. If you are looking for a highly cushioned shoe that feels awesome and won’t rob you of energy, the Vanquish 2 is your shoe. While it is a little more expensive than some shoes, there are many people that prefer or need more cushion because of injuries. The Vanquish 2 is made for long runs, tempo runs, or progressive runs, but can be enjoyed at any pace. This will be in my rotation of shoes, especially when my feet are in pain and need some extra TLC. I am really impressed with this shoe and definitely see why the Vanquish 2 continues the tradition of getting major awards from Competitor.com, just like the Clifton and Clifton 2. I would definitely recommend this shoe, but as with all shoes, they will not work for everyone. 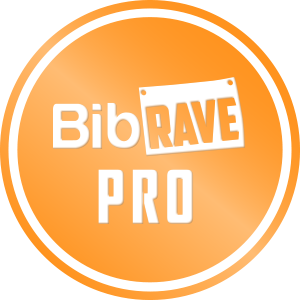 Check them out at your local running store and let me know what you think.